Your search for 7.3 in all categories returned 98 results. The Hypermax cowl air induction system provides cooler turbocharger inlet air temperature, lower air cleaner restriction, and lowers exhaust manifold temperatures. 1994 7.3L Ford factory turbocharged engines only. The Hypermax cold air induction system provides a cooler turbocharger inlet air temperature, a lower air cleaner restriction, and lowers exhaust manifold temperatures. 6.9/7.3L Ford diesel vans only. The Hypermax Maxchip is designed to plug into the vehicle's engine control module to increase vehicle performance and fuel economy. The factory 250 horsepower rating can be increased to 330 horsepower with this chip. The Hypermax Maxchip is designed to plug into the vehicle's engine control module to increase vehicle performance and fuel economy. The factory 250 horsepower rating can be increased to 300 horsepower with this chip. 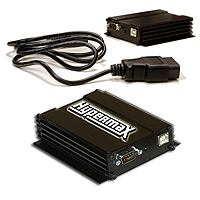 The Hypermax switchable Maxchip is designed to plug into the vehicle's engine control module to increase vehicle performance and fuel economy. The factory 250 horsepower can be changed on the fly to 300 BHP/660 Ft./Lb. or 330 BHP 720 Ft./Lb..
Hypermax Performance Main Bearings (Standard). Main bearings designed to combat high oil temperatures and constant high engine loads. Set of 8. 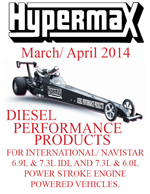 Hypermax Performance Main Bearings (.010). Hypermax Performance Main Bearings (.020). Hypermax Performance Main Bearings (.030). Hypermax High Performance Rod Bearings (Standard). Rod bearings are a traditionally problematic area for high performance diesel engines. These bearings are designed to combat high oil temperatures and constant high engine loads. Set of 8. Hypermax High Performance Rod Bearings (.010). Hypermax High Performance Rod Bearings (.020). Hypermax High Performance Rod Bearings (.030).